Cost is a major consideration in any decision about senior care. No matter where you live, where you come from or how much money you make, we all want the best possible care for our loved ones. But, the reality is that many senior care options can be expensive, particularly where long-term care is concerned. According to a study published in the journal, Inquiry, the typical senior in the United States will need approximately three years of long-term care during their retirement. And, when you consider the fact that the average annual cost of base rent at assisted living communities is a whopping $41,000 per year, it’s easy to see how cost becomes a huge factor in the decision-making process. Step #1. Figure out all current living expenses. Before you do anything else, you’ll need to understand the costs of your loved one’s current living expenses. Why is this important? Because if you’re considering in-home care or even an adult day health care (ADHC) program, there’s more than just the cost of care to consider; you also need to think about the costs of staying in the home, including the mortgage, property taxes, maintenance and repairs, utilities and groceries. Inflation – Typically, the cost of living goes up one to two percent a year due to inflation. Home Modifications – In order to live safely in the home, some modifications may need to be made, such as installing grab bars, handrails or ramps. Step #2. Gather information about the price of senior care options in your area. Once you get a clear understanding of your loved one’s expenses and financial situation as a whole, you then need to determine which senior care options are available to them. The cost of senior care can vary wildly, depending on a number of different factors. Below is a side-by-side comparison of the average costs of senior care in the United States in 2017. As you can see, the costs of senior care vary dramatically, depending on the level of care that you need. But, it’s important to keep in mind that these are just national averages, and the true costs of care in your area may be more or less than what is stated above. It’s also important to keep in mind that, foregoing the type of care your loved one needs due to cost alone could lead to higher medical expenses down the road. And, that leads us to Step #3. Step #3. Consider payment options to cover the costs. The costs of senior care can be quite steep, and when you’re faced with paying more than $80,000 per year for a nursing home out of pocket, it’s easy to see why it’s such a major source for stress and anxiety for families everywhere. But, luckily, in most cases, there are other payment options available for your consideration. Medicaid is a joint state and federal program designed to help people with low income and assets pay for their medical bills. Medicaid can cover the costs of medical care, such as hospital and doctor’s visits, but it can also be used to cover the costs of long-term care, such as nursing homes, in-home care and some adult day health care (ADHC) programs. In order to be eligible for Medicaid, or your state’s Medicaid program, like Medi-Cal in California or SoonerCare in Oklahoma, you must meet the financial requirements. That means that your income and assets can’t exceed the minimum levels used in your state. Following hospitalization – Medicare will cover the costs of a short stay in a skilled nursing facility following hospitalization if you had an inpatient stay in the hospital for at least three days, if you are admitted to a Medicare-certified facility within 30 days of the inpatient stay in the hospital and you require skilled care, like physical or occupational therapy. To treat certain conditions – Medicare will cover the costs of some services that are deemed medically necessary by your doctor, which include part-time skilled nursing care, therapies provided by an in-home health agency that is Medicare-certified and medical supplies, such as wheelchairs, oxygen, walkers, etc. There is no limit on how long Medicare will cover these services as long as your doctor reorders them every 60 days and they are deemed medically necessary. To prevent decline caused by medical conditions – Medicare can cover ongoing treatment to prevent future decline caused by medical conditions that may not improve, such as ALS, Parkinson’s disease and Multiple Sclerosis. Hospice care – If your loved one is suffering from a terminal illness, or has stopped seeking treatment for an illness and is not expected to live longer than six more months, Medicare can cover the costs of hospice care from a Medicare-approved provider. Long-term care insurance is a private insurance plan that helps to offset the costs of long-term care. In most cases, your average LTCI policy will cover ADHC programs, assisted living, in-home care, respite care, hospice care and skilled nursing care. However, it’s important to keep in mind that LTCI policies come in all shape and sizes, and while one policy may cover the majority of the costs of all of these senior care options, other policies may not cover some care options at all. It’s also important to note that some medical conditions may make you uninsurable by some LTCI providers, such as dementia, kidney failure and schizophrenia, so it’s best to begin LTCI policy before conditions develop if possible. Combination Insurance Policies – Some policies combine both life insurance and LTCI into one policy. This ensures that the benefit will reliably get paid, regardless of whether it’s a life insurance benefit or it covers the costs of senior care. Life Insurance Settlements – You have the option to sell your life insurance policy to cover the costs of long-term care. Accelerated Death Benefit – You have the option to take out a tax-free advance on your life insurance benefit to cover the costs of memory care or an assisted living. Home Sale – If you’re no longer living in the home, selling it can help to provide you with the necessary funds to cover long-term care. Bridge Loan – Bridge loans provide the funds right away to cover medical costs, while the home is still being prepared to sell, and they are ideal for emergencies when you need funds on short notice. Reverse Mortgage – Reverse mortgages are loans eligible for people who are 65 or older, and they make it possible for a homeowner to access the existing equity in their home as cash. These loans do not have to be paid off until six months after the homeowner has moved out or passed away, at which time the home is sold and the balance is repaid. The biggest benefit to these loans is that, even if the home sells for less than the loan amount, the estate is not responsible for the additional debt. 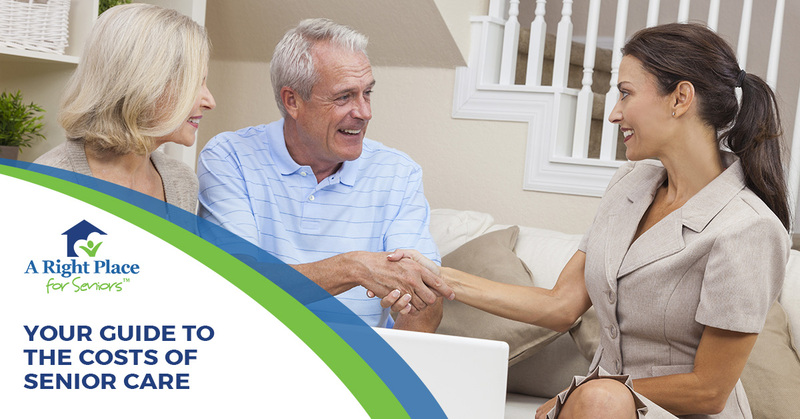 Let A Right Place for Seniors help you find the right option for your budget and your needs. As you can see, there are many things to consider when it comes to covering the costs of senior care, and with so many factors up in the air, it can get complicated quickly. We hope that this blog will shed some light on the costs of care and how to cover them, but please don’t hesitate to contact our Senior Living Consultants to learn more and to find the right senior living option in your area. We have experience and expertise on our side, and our senior placement services are available to you at no cost. Take the guesswork out of this incredibly complicated process. Get in touch with a Senior Living Consultant near you today!